Boxes 1, 3, 5, 16, and 18 are all wages boxes on the W-2 form. However, these wages don't always correspond to an employee's gross wages from their final paycheck. This may confuse employees whose annual salaries and W-2 wage reporting don't match. The most common reason for this discrepancy is the impact of pretax deductions, such as Section 125 health-related deductions or retirement plans like a 401(k). These pretax deductions reduce the amount of taxable wages reported on a W-2. The following example shows how gross wages and pretax deductions may appear on a paycheck. The year-to-date gross wages for this employee is $900. However, for the year they had $125.50 + $16.80 in health-related pretax premiums and $27 deducted for a pretax 401(k). Be careful not to include any NT items like a employer 401(k) match or a NT reimbursement in your wages total. Section 125 Health/Dental/Vision/AFLAC or HSA items are pretax, meaning they reduce the employee's taxable wages by the amounts deducted. This applies to all tax types: OASDI/Social Security, Medicare, federal income, state income, and most local taxes. Thus the sample employee's taxable wages for OASDI/Social Security and Medicare will be reduced by those amounts on their W-2. 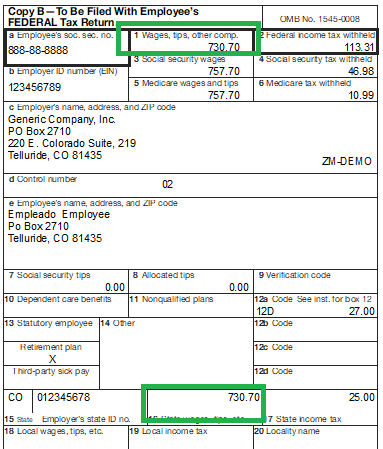 In this sample, the employee's OASDI/Medicare wages equal $757.70. 401(k) and other non-Roth retirement plans are pretax against the employee's federal, state and local wages only. Thus the sample employee's wages for Box 1 federal wages will be lowered again by the 401(k) amount of $27.00. In this example, the total pretax deductions equals $169.30. With the pretax deductions applied, the Box 1 federal wages equals $730.70 ($900 gross wages - $169.30 pretax deductions). If these pretax deductions still don't explain the variance, the employee should compare against their final check dated in the calendar year. IRS wages go by the date the wages were paid rather than when they were earned. Thus for example, the employee's end of December wages may not have been paid until the following year or perhaps their first check in the year was for the prior December's wages. It is not uncommon to have some sort of variance on gross wages on a W-2 compared to an employee's gross salary package. Those wages are being paid; they just might not have fit neatly into the calendar year that a W-2 references.